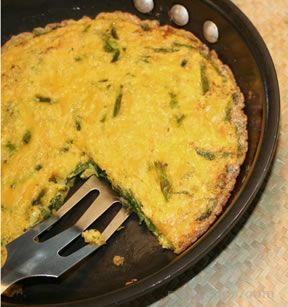 A wonderful combination of flavors with very little work. Can easily be doubled or tripled. Put large pot of salted water to boil. Dice bacon and cook in skillet over medium heat until crisp. 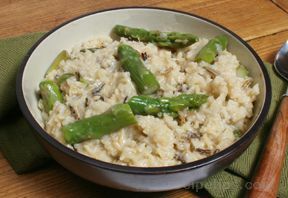 Wash asparagus and cut into pieces, discarding tough ends. When water boils, add pasta, stirring once or twice to make sure pieces are separate. After pasta has cooked 4 minutes, add asparagus. Boil another 5 minutes, or until both pasta and asparagus are crunchy-tender (al dente). 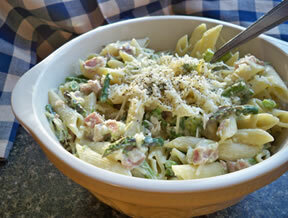 While pasta and asparagus cook, pour off all but 1 tablespoon of fat from bacon skillet. 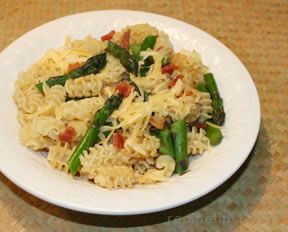 Drain pasta and asparagus and add to bacon in skillet. Stir, over medium heat, to mix well. Divide onto serving plates and sprinkle cheese over. Pass olive oil to pour over, if desired.